What type of Self Adhesive Vinyl (SAV) should I use for my Stickers and Signage? Note: All window graphics are printed with the same high resolution full colour digital print - the only difference is the type of vinyl used. Why you would choose this product: This is the preferred method for high quality window graphics when your window is not tinted and has no obstructions on the inside that might prevent installation. Application: Applied to the inside of the window so the digitally printed graphic can be viewed from the outside. When viewed from the inside you will see the white backing - but there will be some bleed through of the graphic (in reverse) - particularly when the sun is shining on the window. Advantages: The main reason for applying the window graphic to the inside of the window is to protect the signage from vandalism and environmental damage. Viewing the graphic through the glass window also provides a nice gloss finish for the graphic. Please note that this is our preferred window graphic method - but should only be used for non-tinted windows. Disadvantages: Cannot be used if the window is tinted or obstructed on the inside. Why you would choose this product: This method of window graphics would be used if you need a low cost short term solution for window graphics. It is perfect for promotions. It must be applied to the outside of the window. Application: Applied to the outside of the window so the digitally printed graphic can be viewed from the outside. There will be some bleed through of the graphic for viewing from the inside (in reverse) - particularly when the sun is shining on the window. Disadvantages: When the window graphic is applied to the outside of the window, there is a risk that it can be vandalised and it can be adversely affected by environmental conditions. Material Used: White gloss polymeric window graphic vinyl with a clear gloss or matt polymeric vinyl applied over the top of the window graphic vinyl to provide extra protection and UV resistance. Advantages: Will last longer than the short term 2 year window graphic vinyl. The main reason for applying the window graphic to the outside of the window is to avoid visibility issues when the glass is tinted (application to the inside of the window is preferred). If the graphic is applied to the inside of a window which is tinted, the tint will significantly darken the image and reduce visibility of the graphic. Why you would choose this product: One Way Window Film would be used if you need to see out of the window when the high quality graphic has been installed (i.e. you do not want the visibility from the inside blocked). Suitable for office windows and vehicles. (optional) Optically Clear Lamination: This is a clear polyester material which provides good visibility when applied to the one way vision vinyl as well as providing protection for the digital print and extra UV protection. It also stops water getting into the holes in the one way vision (which allows visibility when the product is wet). This lamination is recommended for high traffic areas and for vehicles. Application: Applied to the outside of the window so the digitally printed graphic can be viewed from the outside. When viewing from the inside there is very good visibility through the one way vision material which will have a grey colour appearance. Special Note: The one way vision material works on the basis of there being more light on the outside than the inside. If there is more light inside than outside (i.e. at night with lights on inside) the visibility of the graphic will be much less and there will be significantly more vision through the material (i.e. you will see through the material to the inside). 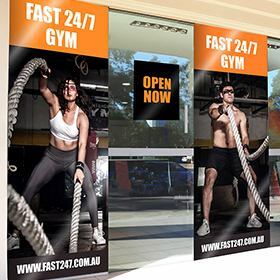 Advantages: The main reason for using this product is to provide a high quality graphic image on the outside of the window while retaining the ability to see out of the window from inside (when standard window graphic vinyls block out all visibility). Disadvantages: As the window graphic is applied to the outside of the window, there is a risk that it can be vandalised and affected by environmental conditions. If lamination is not applied, there is little to no visibility through the one way vision when it is wet. When used for internal offices or at night, the ambient light inside reduces the effect of the graphic and increases the vision through the material. Why you would choose this product: This product would be used if you need a high quality graphic applied to a smooth, low energy surface such as a painted plasterboard wall. For rougher surfaces we recommend the use of solid panel signage such as foam PVC or aluminium composite panel. It is perfect for long term use on internal walls in businesses or homes - and it’s removability also makes it ideal for short term promotions. Advantages: This product provides a high quality graphic image for the painted plasterboard wall - and will adhere to this type of walls where other vinyls may peel off. It is a low cost way of achieving a large digitally printed graphic. The Phototex drops overlap so joins are barely noticeable. Disadvantages: Cannot be used for rougher surfaces such as concrete or timber walls as adhesive vinyls will not adhere to these surfaces. You would need to use solid panel signs such as foam PVC or aluminium composite panel for these rougher walls. Click here to view our installation instructions blog post. Why you would choose this product: This is a great product to use when you want to display a product on the floor of a shop or office - in full view of the people walking over the graphic. The floor should be a smooth sealed surface such as painted concrete, tiles or laminated flooring. The floor graphic can be die cut to shape for maximum impact. a) Our Economy Floor Graphic is rated at R9 slip resistance and suitable for applications up to 3 months. b) Our Premium Floor Graphic is rated at R10 slip resistance and suitable for applications up to 9 months. Material Used: White monomeric vinyl with a special anti-slip floor graphic clear monomeric lamination applied over the top of the digitally printed vinyl. The base vinyl has an adhesive which is removable for up to 12 months. The floor graphic lamination has been specially developed to provide a surface which minimises the possibility of someone slipping on the floor graphic. Advantages: This product provides a high quality graphic image which can be die cut to shape and applied to floors. It can be used in shops or offices and placed in high traffic areas for maximum visibility. Can be self installed and can be easily removed within 12 months. Great for store promotions. Disadvantages: Will not adhere to non-smooth surfaces such as carpet or non-sealed concrete. Note: All custom stickers are printed with the same high resolution full colour digital print - the only difference is the type of vinyl used. Our custom stickers can be produced in any size larger than 35mm and are die cut to shape. All our sticker vinyls have an adhesive which is removable with heat and chemicals. We have 5 different vinyl types for our custom stickers - 4 of these vinyl types are white and 1 vinyl type is clear. Why you would choose this product: The clear stickers are generally used when the sticker has a shape printed onto it and you want to be able to see the background colour of the product it is being applied to (instead of a white or coloured background on the sticker itself). Need white colour printed onto the sticker. Our printers do not print white colour - so any white in the design will be clear. Require the most vibrant colours to be printed. As these stickers do not have a white background the colours will not be as vibrant as they are when printed on white vinyl. (optional) Clear polymeric vinyl applied over the top of the digitally printed clear vinyl. This lamination will provide mechanical and extra UV protection for the digital print. Cutting: The stickers are die cut to shape and supplied individually Note: We can also supply the stickers kiss cut on sheets by special request. Advantages: This type of sticker allows you to see through the clear artwork sections to the colour of the product it is applied onto (instead of having a white or coloured background on the sticker). This can be beneficial for designs which are in full colour or too intricate to be supplied in computer cut solid vinyl. These stickers are generally much lower cost than computer cut solid vinyl stickers. Why you would choose this product: The gloss white economy stickers are a low cost product which provides high quality digitally printed stickers for short term (1 year) use. These stickers can be used for most applications although are not recommended for vehicle signage. Why you would NOT choose this product: This product is not suitable for boat applications - it is not resistance to salt water. For these applications you should use our 3M cast vinyl. (optional) Clear monomeric vinyl applied over the top of the digitally printed white vinyl. This lamination will provide mechanical and extra UV protection for the digital print. Advantages: These stickers are the lowest cost digitally printed stickers. While the vinyl is a 1 year vinyl you still get the same high quality digital print. These stickers are usually much lower cost than computer cut solid vinyl stickers. Disadvantages: The vinyl is a 1 year vinyl - for more permanent installations you should use our premium or Avery cast vinyl stickers. Why you would choose this product: The gloss white premium stickers are a great all round product with 3 year vinyl and high quality digital print. These stickers can be used for bumper stickers and most applications where greater durability is required. Advantages: The premium vinyl stickers are a great all round product suitable for use in most applications. The vinyl is good medium term 3 year vinyl and still provides the same high quality digital print. These stickers can also be used for vehicle application (flat surfaces only) and are the preferred product for bumper stickers. Why you would choose this product: The Avery gloss cast vinyl stickers are the top of the range product. This product is the best product to use for vehicles and boats and has the longest life expectancy of 5-7 years. It is a “bubble-free” vinyl which has adhesive air release channels for easy installation. (optional) Avery gloss cast lamination applied over the top of the digitally printed vinyl. This lamination will provide mechanical and extra UV protection for the digital print and is recommended for vehicle applications. Application: Applied directly to smooth flat surfaces. When applying to non-flat surfaces we recommend using an experienced installer and complying with Avery installation instructions. Advantages: The cast vinyl stickers have the longest life expectancy of all the sticker vinyls. The cast vinyl has a pressure activated adhesive which allows for easy re-positioning and it has very good hiding power. It can be stretched and conforms to curves and corrugations. It has a removable adhesive and can be removed with heat or chemicals. Disadvantages: Higher price than the other vinyls. Why you would choose this product: Gloss White High Tack (3 year) SAV would be used if you need to apply new digitally printed signage onto low energy surfaces such as plastic bins, caravans and surfaces which are not completely smooth. Materials Used: Avery Gloss White High Tack (3 year) self adhesive vinyl with an optional clear matt, gloss or gloss anti-graffiti lamination applied over the top. It has a permanent adhesive. The clear lamination provides protection from mechanical and UV damage and assists installation. Application: Applied directly to the surface. Advantages: This is a great product to use for surfaces where normal self adhesive vinyls do not stick. Why you would choose this product: This product would be used if you need to apply new digitally printed signage over an existing panel such as an aluminium composite panel (but you do not need the panel itself). Materials Used: Avery Gloss white polymeric “bubble-free” vinyl (3 year) with a clear gloss polymeric lamination applied over the top. The base vinyl is a “bubble-free” vinyl which has adhesive air release channels for easy installation of large graphics onto panels. It has a permanent adhesive. The clear lamination provides protection from mechanical and UV damage and assists installation. Application: Applied directly to flat smooth surfaces. Bubbles caused by air entrapment can be smoothed out. Advantages: This is a good medium term bubble free vinyl which is easy to apply due to the adhesive air release channels - so is great for applying to existing panels and any other flat surface. If you would like some assistance to work out the best type of vinyl for your application, please contact our friendly customer support team. ​Window Graphics are high quality vinyl printed in full digital colour and are designed to be installed onto the outside or inside of your windows. The high resolution graphics provide a tremendous impact on shop windows - for a surprisingly low price!